Men's fashion is a bold world of textures and colors of another dimension. Brett Johnson introduces us to his special world of style. Brett: I grew up in Northwest, DC and went to and then departed to Middleburg, Virginia to finish middle school and then came back to Alexandria, Virginia, and went to a boarding school called Episcopal High School, which is across the bridge from Georgetown. Copa: At what age did you become interested in clothing design and when did the fashion bug bite you? Brett: Probably at about age 6 or 7. 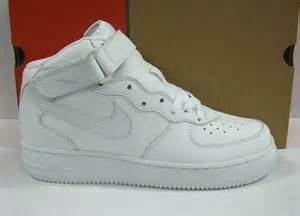 I always had to have the latest Air Force 1s, a popular sneaker back at the time. It was an all white shoe. I had a cobbler up in New York City that I would take them to. I would show her a bunch of leathers and fabrics form all around the world -- places like Italy, China, you name it. The cobbler applied all these fabrics and leathers to the shoe and I created my own style that way. A lot of my friends gravitated toward what I was doing and thought I should take it a little more seriously. Over time, I began to create my own aesthetic and developed the Brett Johnson Collection. We first launched in the 4th quarter of 2013 with a line of shoes. That's how I got introduced to the fashion industry. Customers wanted to see a little more of who our guy was and what our aesthetic is, and that's when we started with outerwear. For the Autumn/Winter 2015 Collection, we will introduce knitwear and for the Spring/Summer 2016 Collection, we will introduce trousers and woven shirts. Brett: For me, it's what I know. So I wanted to stick to what is very familiar to me. I feel like I have a very good understanding of 21st century guys/millennials as well as the older demographic in terms of the Baby Boomers. With BJ, we try to hit on three different personas: The "Urban Sophisticate," a guy age 21-30 more interested in sneakers, the "Creative Corporate," who could be in entertainment, an athlete or an architect. Third, we have the "Global Citizen." This guy is well-versed in travel, an art collector, a watch collector, or a car collector. They've seen the world, they are very refined and cultured. 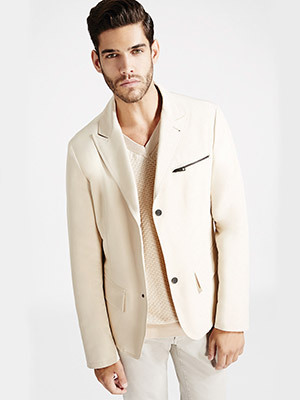 So, I think in terms of men's wear, I know what guys like and the aesthetic they are looking for. Copa: What sort of materials do you usually prefer to work with specifically? Brett: I love texture and layering with texture. So, for me, my aesthetic has been a lot of tonal pieces. With the tonal affect, we could say its a tech piece for our pre-Fall collection. I'll take a blue and layer it with different tech fabrics. We have a beautiful Oxy Nylon with a brush patent but its tonal, so you are getting the different effects with the fabric. Some of those fabrics will be shower proof so you can literally wear them in the shower and not get a drip of water on you! 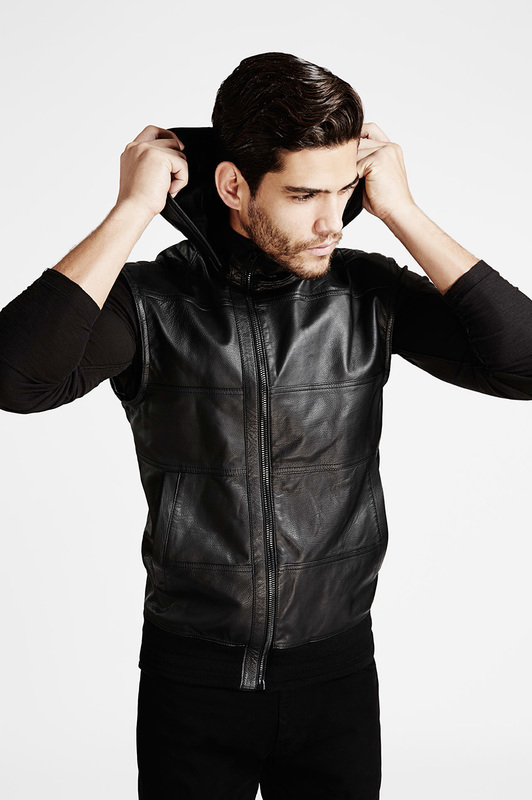 We also uses a lot of calf grain and lambskin for our leather outerwear pieces. Those are two of the most supple leather that you can find. I like fabrics with a bit of grain. If you look at plain leather, it has no texture to it, and it can almost be mistaken for pleather. I don't want that to be associated with the brand. We use the utmost quality in all of our products. When you look at some of our Fall/Winter Collections, we use textured wools. The cool thing about this is they will have different weaves inside the wool, which gives versatile appeal to the clothing. Copa: At what time did you decide to open your own design business? 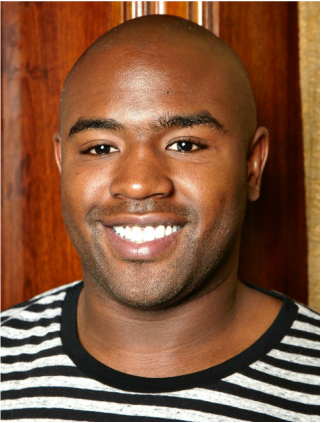 Brett: Three years ago, I was attending the University of Michigan, studying Sociology. It was a little bit of back and forth with my parents, who wanted me to finish school and get my degree. But the entire time, I always knew what I wanted to do. Finally, they gave me their blessing. We've been in business for a year and a half, and we've come quite a way in a short amount of time. Copa: What can we expect to see at your upcoming Trunk Show at Neiman Marcus at the Mazza Gallerie here in Washington, DC? Brett: At the trunk show, we will be launching our Pre-Fall 2015 Collection, which will also be on NeimanMarcus.com beginning June 8. This is our coming out party. There's no better place to do it than here in my hometown. 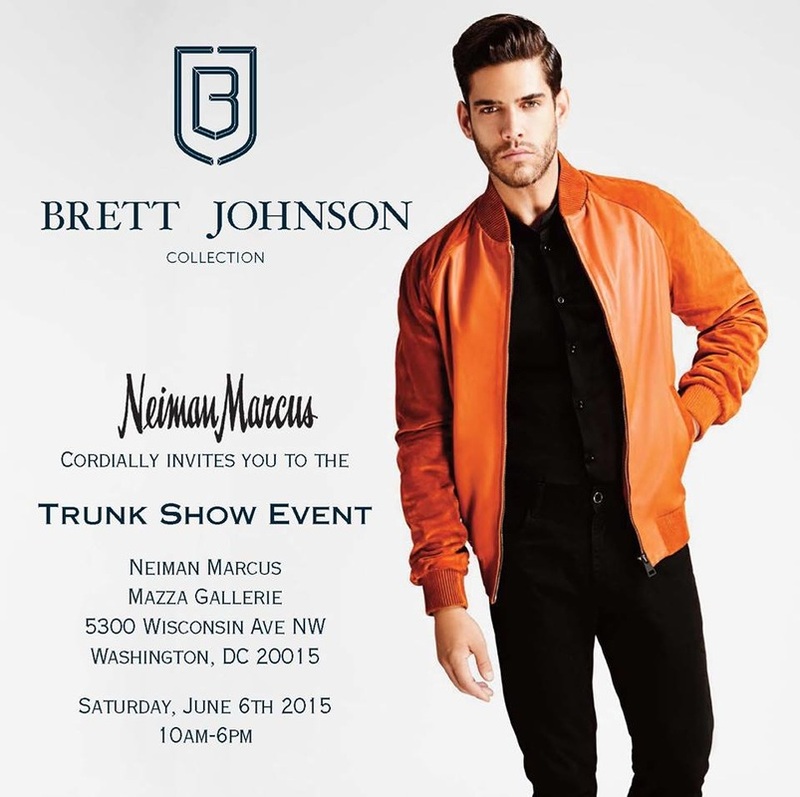 This is the official launch of Brett Johnson at Neiman Marcus. Copa: What is your philosophy to your particular style and fashion? Brett: I grew up in the entertainment world. That is somewhat my heritage, my lineage. Within that, you get your own sort of fashion and hip hop style. My favorite place to travel was Italy as a little kid. I was blessed enough to get a chance to travel to Italy quite a bit. So that's what drew me to Italy in terms of source and fabric, source and leather. All production is made and crafted over there. They have some of the most amazing artisans in the world. So for me in terms of aesthetic, I try to infuse hip hop style with a more tailored Italian aesthetic. Copa: What does the future hold for Brett Johnson and your fabulous fashion? Brett: There's no telling. I am taking it day by day. I don't want to get too far ahead of myself. My end goal is making Brett Johnson a household name and to eventually open up stores globally. Hopefully one day I will be one of the top - not just African American - designers in the world.